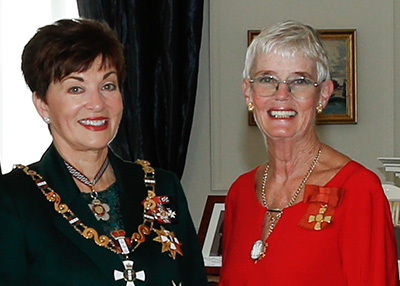 FHT director Libby Robins was made ONZM by the Governor-General, Her Excellency The Rt Hon Dame Patsy Reddy, at an investiture ceremony in Government House, Wellington, in May. Libby Robins was named in the 2017 New Year’s Honours List as an Officer of the New Zealand Order of Merit, for services to children’s welfare. Alongside a number of other social work professionals, Libby established FHT in 1990, and has served as its director since then. Leading Canterbury social service agencies Aviva (family and sexual violence services) and Family Help Trust (supporting children under-five born into high-risk environments) have partnered with other prominent NGOs and an Integrated Health Service Centre led by Linwood Medical Centre, to form a child, family and community wellbeing centre – The Loft - in Christchurch’s Eastern Suburbs. Having lost their premises in the 2010/2011 earthquakes, several NGOs decided to seek long term accommodation that was beyond business as usual – to take the opportunity to create a more integrated and purposeful approach to working together, by co-locating. Their ultimate goal has been to significantly remove complexity in service seeking and, in doing so, to enhance outcomes for children, families and communities. Whilst looking for premises to develop and support service integration and partnership, they learned that Better Health was intending to move their medical services into Eastgate and create a ‘health hub’. Eastgate Shopping Centre was heavily damaged in the 2011 Canterbury earthquakes and had been rebuilt and strengthened. Through further talks, it was realised that together health services and social services could provide an even more comprehensive co-located range of support than either group could do alone. Bringing together services from the social service, health and wellbeing sectors makes this a unique proposition in New Zealand. The opportunity to place health and wellbeing services within the Centre supported the desire of Eastgate’s owners to make the Shopping Centre a centre for their community as well. Eastgate is also practically ideal as it is serviced by good public transport links from a range of locations across Christchurch and offers plenty of free parking for clients and staff. It is close to multiple primary and secondary schools and the Nga Hau E Wha National Marae. The community and social wellbeing centre side is also available as a community space. A large meeting room within this side of The Loft can be made available at a low cost to community groups for meetings or training, and wellbeing activities such as exercise classes or anti-natal groups could potentially also use the space. For co-locating social service agencies, The Loft brings opportunities for significant efficiencies in a number of day-to-day organisational business management processes through utilising scale and collective procurement contracts. The social service group has raised the capital required for their fit-out up front, to ensure ongoing sustainable rent. 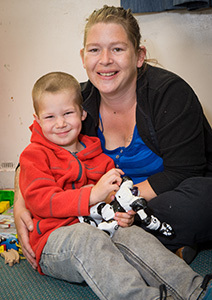 Amanda and her four-year-old son Kayden are in their first year of the Hippy programme at Hoon Hay, with tutor Danielle. “Kayden is a bright boy and he just loves the Hippy activities. He is always testing out what he has learnt with colours and shapes and showing me what he knows. His kindy teachers are amazed at his vocabulary, which comes directly out of what we are doing with Hippy. He thinks he is the bee’s knees, so proud to show off what he can do. “I am so pleased to be able to do this for him. My earliest childhood, when my father was around, was difficult, with drugs, alcohol and violence in the family. I am so determined to show my children that there are opportunities for them to lead a different kind of life than the start I had. “Kayden and I really enjoy this. Hippy should help to give him the best start to school, which will open up so many opportunities that were never available to me. I see him learning and understanding things now that I didn’t know until I was at intermediate. “What I want when he is older is for him to be able to progress from this to good qualifications, a worthwhile job and a happy family life.